The Santa Croce district is a major cross-roads of Venice, whereby hundreds of thousands of people a day enter and exit the city. Yet, it is also one of the most tranquil parts of the city. The beautiful Campo San Gioccomo Del Orio is one of few major squares in Venice still mostly enjoyed by locals, and the shops, bars and restaurants in this neighborhood still embrace quality over quantity. Nightlife in Santa Croce ranges from a quick spritz standing at a tiny street corner bar, to long evenings enjoying a bottle of wine at a table in the square. Two of our favorite bars in all of Venice are here! Osteria Da Filo-Wine N' Music (Popa), 1539 Santa Croce, Near Campo San Giocomo Dell'Orio. Do not be scared away by the crowds that always seem to gather here in the evening. 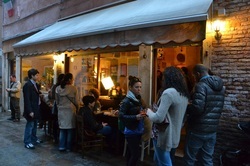 Da Filo (also known a “Popa”), is a large and clean establishment that serves up some of the stiffest drinks in Venezia! The atmosphere is relaxed and low-key, with a smattering of vintage furniture that invites guests to sit for hours. The prices are reasonable and the bartenders are generous. Why wouldn't people flock there? Don't miss jazz nights! Bacaro Quebrado, S. Croce 1107/A on Calle dei Bari. Who could resist such a reasonable happy hour? Bacaro Quebrado is a fairly new bacaro in Santa Croce, but it already has a loyal set of regulars and attracts many passers by to it's 3 euro spritz and cicchetti time from 6:30 to 8. It's easy to see why! Not only is 3 euros a perfectly reasonable price for a spritz alone, Bacaro Quebrado throws not only crostini, but also pasta, bread, salad and other prepared vegetables into the bargain. Unsurprisingly, many guests decide to stay on for dinner! MiTi Cafe & Cocktail Bar, 666 Santa Croce, On Calle di Chioverette. 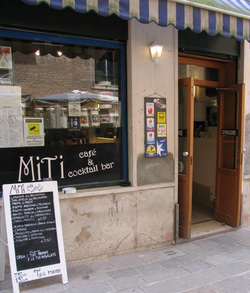 The Miti Cafe and Cocktail Bar in the Santa Croce district is one of very few bars in Venice that focus on cocktails rather than wine and spritz. Miti has outdoor seating on two sides, and has a large and comfy cocktail lounge in the back. Miti also gets a big plus for being the first, and possibly the only, bar in Venice to offer everyone a free glass of water with his or her coffee. But, their real claim to fame is their extensive menu of elegant cocktails all of which are offered at very reasonable prices.